Help us meet our match! We’re in the middle of a match campaign and need your support! In 2015, Transition Fidalgo & Friends continues to raise awareness about the realities of climate change and fossil-fuel dependency, and to encourage meaningful personal and community actions in response. We’ve done much as an all-volunteer organization (community gardens, skillshare workshops, Time Bank, Vision 2030, Fix-It Days, to name just a few) but there are expenses involved in making things happen. TF&F has a commitment from a generous donor for $5,000 to be used in a matching gift program. If we can collect $5,000 in contributions by October 1, they’ll be matched for a total of $10,000 to support our programs. Any size contribution is very much appreciated, so please help us take advantage of this opportunity. Checks should be made out to Transition Fidalgo and Friends with the word “match” in the memo field. Mail donations to PO Box 62, Anacortes; use PayPal; or give your donation to Ron Larson, Treasurer, at a monthly dinner meeting. This entry was posted in News flashes on June 12, 2015 by MaryBeth. On April 17, 2015 Governor Jay Inslee declared a drought in 13 additional river basins in Washington state. The drought declarations bring the total number of Washington’s watersheds in drought emergencies to 24, 44 percent of the total area of the state. See updates here. Rain gardens. Resources for creating one in your yard. Great website. This entry was posted in News flashes on May 14, 2015 by MaryBeth. Next month, Eric de Place will be in Anacortes to discuss the alarming growth in oil train traffic through Skagit County and the costs and consequences of the oil-by-rail industry for local residents. We hope you can make it that evening, and if you can, spread the word to friends and family as well. This event is free and open to the public, and seating is on a first-come, first-served basis, so please arrive early. There will be coffee, tea, and dessert to help warm things up. P.S. In case you missed it, Sightline rounded up ten recent oil train explosions, in photos. It got a lot of attention on social media, and it was even mentioned in this news article. This entry was posted in News flashes on May 13, 2015 by MaryBeth. 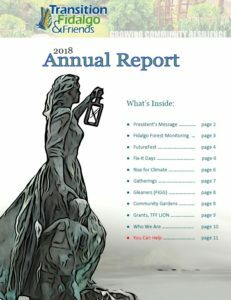 Our 2018 Annual Report .